When you think of books, and by extension book stores in Canada you immediately think of Indigo. With hundreds of locations across the country, Indigo provides an oasis for book lovers of all ages, in an environment that encourages visitors to spend time browsing its well-organized shelves and beautifully merchandised displays. Over the years, Indigo has expanded its offering to include paper products, toys, electronics and general merchandise, all carefully curated lifestyle enhancing products. Indigo wanted to provide an online experience that was similar to what customers have come to expect in-store. In order to do so, they started from the very beginning, which meant reconstructing the taxonomy of the retail site, including the collection taxonomy and customer-facing web-hierarchy. The end result was a presentation taxonomy that is augmented for findability with a strong consideration for search engine optimization. In order to present well-organized and informative product listings, you need to start with good source information. Retailers rely heavily on the data provided to them from manufacturers and unfortunately the quality and completeness varies significantly depending on the supplier. The geekspeak team leveraged existing templates and did extensive research to determine a near-exhaustive list of product attributes broken down by category. From there, the team refined the list of attributes that were deemed most important, and therefore required, while defining the attributes and their formats. By completing this task, the team was able to create collection templates to aid in proper classification and data collection. With the collection taxonomy in place the geekspeak team then did additional research and analysis to determine the best presentation of Indigo categories and sub-categories. The team conducted keyword research and a competitive analysis to ensure that categories were organized and named appropriately for search engine optimization and usability. 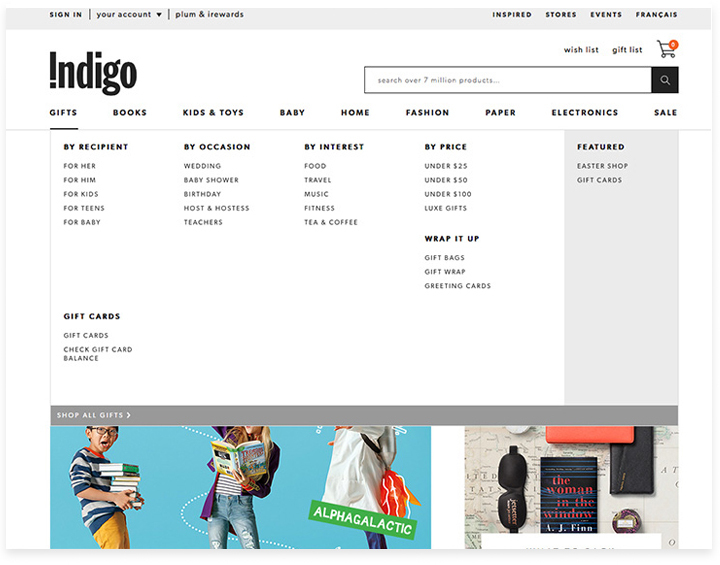 Indigo wanted the online customer experience to be similar to the feeling that shoppers get while in-store. It had to be one where visitors are surrounded by their favourite things - items that are intended to provide joy and enhance lifestyles. When writing the Indigo universal style guide for online product content, geekspeak was careful to incorporate established brand guidelines related to voice, tone and aesthetic all while ensuring that the most important product features and benefits were presented. Individual category style guides combined universal brand guidelines with specific category requirements as defined by the product data being collected.